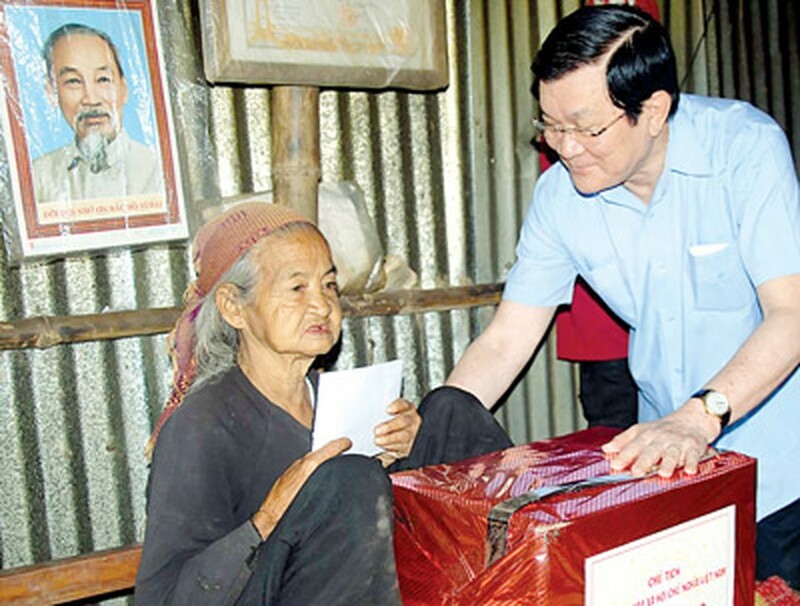 President Truong Tan Sang on December 14 arrived in the central province of Quang Ngai and distributed gifts to local residents who have suffered heavy losses in the recent floods and storm. President Sang lauded the timely efforts made in flood prevention and relief by local authorities. He said that there is need to adopt a scheme to allocate people from flooded areas to safer zones. In addition, schools, medical clinics, markets and cultural centers in villages should be built more solid and firm so that people can take shelter there when floods hit the commune. The President asked local authorities to pay more heed to the living conditions of residents with the Tet festive season approaching near. President Sang proposed thinking about long-term measures which would help minimize losses, with much more importance given to protection of forests and reforestation. He wanted to speed up planting of more trees as more and more storms are beginning to hit the central provinces. Reforestation will also reduce the severe erosion in Ca Mau Cape in the southernmost province of Ca Mau and along the coastline of the Mekong Delta Province of Kien Giang. He stressed on more focus towards reforestation along river sources in Central Vietnam and in Quang Ngai Province in particular. The President shared his grief with 11 households whose relatives and houses were swept away in the recent floods and also gave 120 gifts to residents of Son Nham Commune in Son Ha District, Nghia Ky Commune in Tu Nghia District and Hanh Tinh Tay Commune in Nghia Hanh District. He also had delivered 300 oxen to these flood hit communes to propagate breeding.